Toilet bowl stains can become tricky to deal with. For some people, it may seem like no matter how much they clean, they notice brownish stains showing up consistently. Thankfully, there are some options to flush away those stains so you can feel cleaner in your bathroom. You can walk down the aisle of a store and see several chemical-filled cleaners designed for your toilet. They may work, but you also may not want to be breathing in the abrasive and robust smelling cleaners. Thankfully, there is a more natural approach, such as vinegar. 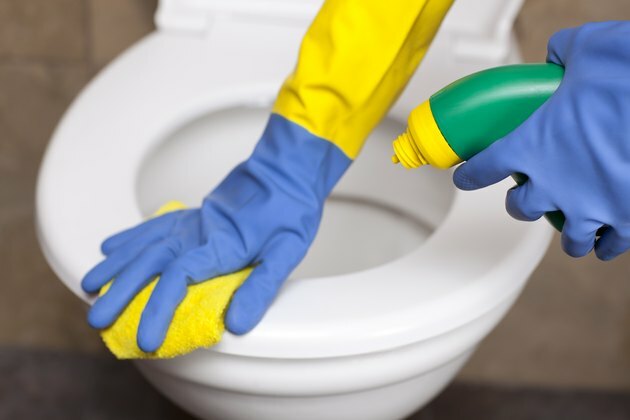 One tip is to use 3 cups of vinegar in the toilet and scrub the stains directly with a toilet brush. Another way is to pour the vinegar into a spray bottle and squirt the solution on each stain. However, if you choose the second option, you will need to drain the toilet. Baking soda is an additional natural cleaning option. Although it's natural, baking soda works efficiently to tackle stains in a toilet bowl. Because of its carbonic acid, scrubbing is much easier. To start with this solution, you will need 1 cup of vinegar and pour it into the toilet. Mix the solution around with a toilet brush. Leave it sitting for approximately one minute. Next, add 1 cup of baking soda and an additional 1 or 2 cups of vinegar. Now you will notice the solution start to fizz. Leave it for about five minutes, then scrub away. Borax has always been known to be a powerful cleaning option. It can be found at most hardware stores. To begin, you will first need to shut off your water supply. Next, flush the toilet. Sprinkle some borax powder on the stains and rub them with a toilet brush. Leave the powder soaking on the stains for 30 minutes, then turn on your water supply. The last step is to flush the toilet and watch the stains disappear. Add one tablespoon of trisodium phosphate into 1 gallon of warm water. Be sure to mix well. Now, grab a cloth and soak it in the solution. Once you soak it, you will need to clean the stain with the cloth. Everyone is bound to get toilet bowl stains from time to time. However, you can do your part by preventing stains from continually accumulating by cleaning your toilet bowl on a regular basis, such as weekly or even twice per week. Additionally, many toilet stains are from hard water, so it would be worthwhile to check into a soft water heater if the stains bother you.